I finally had a bright enough day to get photos of these two new Quick & Easy/Beginner's Quilts and now have the kits available in the shop. Each kit includes pre-cut squares, borders, binding and thread, plus full instructions and links to my free online tutorials, making them ideal for newbies who are maybe a little nervous about fabric selection or cutting. With these kits, they can just get stuck in and start sewing. The first kit features Dashwood Studio's Confetti and Twist fabrics, while the second is made in these lush red and white fabrics from Red Rooster's Coonawarra Red collection. New products also include these gorgeous fat quarter bundles and a charm pack in Michael Miller's Let's Play collection, aren't they cute!! I used these fabrics in my Novelty Nine Patch quilt kit, and they do make a lovely gift for a new arrival. Meanwhile, in my sewing time I'm currently working on two 'secret' projects for magazine submissions, the first is developing my love of curved paper-piecing, with a little fussy cutting of these gorgeous Norrland fabrics from Dashwood. And the second is a larger version of my Wonky Squares block using Riley Blake's Gingham Girls fabrics, I'm really loving how these fabrics look together! Oh my both your secret sewing projects are gorgeous. Pretty fabrics but you really have an eye for putting them together. Lots of great projects going on here. My favorite is those wonky squares. That fabric is perfect for them. Thank you Susan, I'm loving my wonky block, so much potential! Luv your wonky block. Wonky is my favorite way to design! Hi Louisa, I like how you set up your tutorials in your sidebar. Did you use a certain plug in to get the quilt images for each tutorial? Very cute! I love your first secret projects. The detail on your applique block is beautiful! 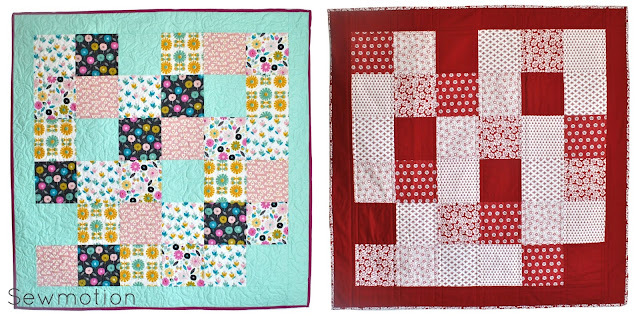 Love both projects you have going, and especially the fabrics in the wonky block - so cheery!